To Cite: Nourmohammadi M, Golbabaei F , Karimi A, Pourmand M R, Noor Poor A , et al. Absorption and Biodegradation of Toluene in a Two-Phase Low-Pressure Bioscrubber Using Cutting Oil as the Organic Phase, Health Scope. 2019 ; 8(1):e65219. doi: 10.5812/jhealthscope.65219. Background: Volatile organic compounds are a major source of air pollution affecting human health and the environment. Different methods are used to remove these pollutants from air streams including conventional and biological methods. 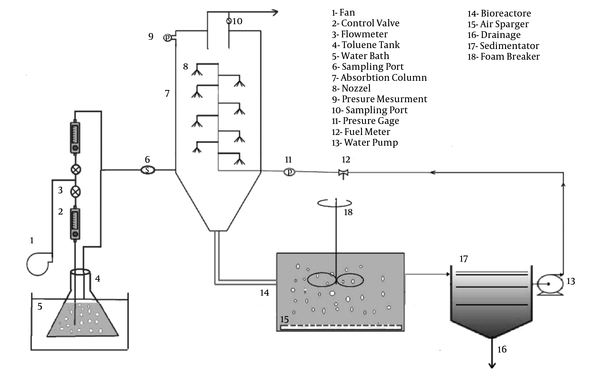 Objectives: In this study, the absorption and biodegradation of toluene were examined in a semi-industrial bioscrubber in order to enhance the absorption rate of toluene in the aqueous phase. Methods: The effect of cutting oil was examined as the organic phase. Mass transfer was measured for water only, as well as for three concentrations of cutting oil in water. The growth of microorganisms in the presence of different concentrations of cutting oil was investigated. The microbial consortium was obtained from a wastewater treatment plant in order to inoculate the bioscrubber. First, the ability of the microbial consortium was tested for the degradation of toluene in a bottle. Results: The results showed 98% of toluene in the bottle was degraded by the microbial consortium. In addition, the use of cutting oil significantly decreased kla (from 3.8 to 0.37). Concerning bioscrubber performance, the use of cutting oil as the organic phase increased the efficiency and elimination capacity from 22.5 to 55 and from 34 to 69, respectively, in the case of oil in water. The elimination rate of toluene increased as 32.5% by adding the cutting oil. Volatile organic compounds (VOCs) are major air pollutants affecting human health and the environment (1-3). Environmental impacts of these pollutants in the air include atmospheric ozone depletion (due to chlorinated compounds) (4, 5), stratospheric ozone production (6), and global warming (7). Benzene, toluene, and xylene (BTX) have been classified as the priority pollutants by the U.S. Environmental Protection Agency because of their toxicity (8). A chronic exposure to a low concentration of toluene may cause a range of effects on human health, such as immunological and neurological disorders. Although the toxicity of toluene is less than the toxicity of benzene and it is not classified as a carcinogen to humans, when it is accompanied by benzene, its carcinogenic effects increase. The IARC has classified toluene as group 3 and ACGIH has assigned it in cancer category A4 (probably not carcinogenic to humans) (9). The use of fossil fuels has been recognized as the most important emission source of toluene to the atmosphere (10). Toluene is also used as an industrial solvent in paints, adhesives, rubber, plastics, and various chemical compounds. To remove volatile organic compounds from air streams, different methods are used, including conventional and biological methods. The conventional methods used to remove VOC from air streams are divided into two groups, physical (absorption, adsorption, and condensation) and chemical methods (thermal oxidation, catalytic oxidation, ozonation) (11). Compared to the conventional methods, biological methods are cost-effective and do not generate secondary pollutions (12). The biodegradation of BTEX by microorganisms was recognized by Stormer in 1908 when he saw bacillus hexabovorum species grew in a medium containing toluene and xylene (13). Biofilters, biotrickling filters, and bioscrubbers are favorable biological systems to remove VOCs from the air stream. These methods are the same concerning the removal mechanisms, but they are different in the use of microorganisms, substrate, and concentration of contaminants. The biofilter is ineffective at high flow rates and concentrations of pollutants. It also has a high head loss, limiting its use in the industrial scale. In addition, substrate toxicity may occur in the entrance of the gas stream. Among the biological processes, bioscrubber has been found to be economical and more reliable in terms of construction and process control compared to other biological processes. Bioscrubber consists of two units, a column through which VOC is absorbed from the contaminated stream to the aqueous phase, and a bioreactor in which the biodegradation of VOC compounds takes place. The aqueous phase is recycled to the column after settling of sludge (14). To increase the absorption of hydrophobic compounds, an organic phase (immiscible with water) is added to the aqueous phase. Some studies have used n-hexadecane (3, 15) and silicone oil (10, 16, 17) as the organic phase to improve the absorption of VOCs from the polluted stream to the aqueous phase. It should be noted that the organic phase must be biocompatible, nontoxic, non-biodegradable, inexpensive and have low volatility, low vapor pressure, low density, no toxicity, and explosion risk (18). Mudliar et al. showed that bioscrubber is more efficient than other methods to degrade VOCs at high concentrations. Other features of bioscrubber are a low head loss, moderate operating cost, and good operating control conditions such as pH and temperature (19). Koutinas et al. showed VOC removal efficiency is higher in bioscrubbers than in biotrickling filters (20). The purpose of this study was to examine the biocompatibility of cutting oil at different concentrations and mass transfer coefficients and select the optimum concentration of cutting oil to be used in the bioscrubber for the removal of toluene from air streams. Since no study has been conducted to determine the compatibility of microorganisms with cutting oil, it was necessary to design some preliminary experiments. For this reason, the following steps were designed. First, 1 mL of activated sludge was diluted in a Falcon 50 mL tube with deionized water to a volume of 10 cc. Three flasks containing 50 mL of the mixture of nutrient broth and cutting oil at the concentrations of 10, 20, and 30% were prepared. One extra flask contained 50 cc of nutrient broth without cutting oil and it was used as the control. Then, 100 microliters of the diluted sludge solution were poured into the four flasks. For the growth of microorganisms, the medium was then aseptically transferred to a flask, placed inside an incubator, and stirred at 250 rpm and 37°C. After 16 hours, 100 microliters of each flask were grown on nutrient agar plates and incubated at 37°C overnight. The growth of microorganisms on the plate at different concentrations of cutting oil was surveyed. All instruments were sterilized by an autoclave before being used. The bioscrubber was inoculated by activated sludge obtained from an oil industry refinery house. It was assumed that it contained microorganisms being able to biodegrade toluene. During the experiment, a fresh nutrient solution (Merck Co., Germany) was added to the culture every day to provide the necessary nutrients for microbial growth (Table 1). Toluene was the only carbon source for microorganisms. To evaluate toluene degrading ability of the microbial consortium, the mixture of nutrient and sludge with a ratio of 3:1 was poured into a 300 mL bottle and aerated for 30 minutes. Then, toluene at a concentration of 100 mg/L was added to the test bottles. The control sample was prepared by adding 1% KCN in order to kill microorganisms. Then, the samples were incubated at 28°C and 90 rpm on a rotary shaker in a dark environment. After 72 hours, toluene at the headspace of the bottles was gathered with a gas-tight syringe and injected to GC-FID in order to determine the toluene concentration. To determine the mass transfer coefficient of toluene concentration at saturation, a 250-mL mixture of water and cutting oil at three concentrations (10%, 20%, and 30%) was prepared in an impinger 500 mL and a gas stream (60 L/m) containing toluene with concentrations ranging from 90 to 100 mg/m3 was passed through the mixture. The concentration of toluene at the outlet and inlet was analyzed by GC-FID. The operational conditions of GC were 200°C injection temperature, 130°C oven temperature, and 240°C detection temperature, with an FID detector and capillary column (0.53 mm I.D, 50 m length, 0.25 µm film thickness, CP-Sil 8 CB). The outlet concentration was measured continuously until it reached the saturation point. The setup was put in a water bath for thermal control (Figure 1). To measure the concentration of toluene in the liquid phase and at saturation, the following equations were used, respectively (21, 22). The schematic diagram of the experimental setup is shown in Figure 2. According to standards, the bioscrubber was equipped with two units. A scrubbing column that was made of stainless steel (H: 1.2 m, inner diameter = 0.3 volume = 84.7, thickness = 1 mm) was equipped with eight nozzles in the intervals of 0.1 m. The sampling ports were placed at the inlet and outlet of gas stream. To measure the pressure of the column, a manometer was used at the top of the column. The biological oxidation took place in the bioreactor containing the microbial consortium (volume 80 L; 75% of the total volume). The experiments were performed at room temperature and the gas flow rate (G) was adjusted at 30 m3 h-1 (EBRT: 10 seconds). To measure the gas phase toluene concentration, the gaseous samples were collected from the two sampling ports placed at the inlet and outlet of the absorption column and then directly injected to GC by a gas-tight syringe (Hamilton US). The resulting area was compared with a calibration curve to determine the concentration of toluene in the samples. During the operation period of the bioscrubber, 3 L of the liquid medium was drawn off and renewed with fresh nutrient solutions every day to control pH and provide nutrients for microbial growth. The air stream was supplied with a fan (airflow, UK) and a minor fraction of the air stream was bypassed into a flask filled with liquid toluene (Merck Co., Germany), placed in water bath for thermal control. By adjusting the flow rates of the bypassed streams, various concentrations of toluene were produced. The stream containing contaminant vapor was then mixed with air and conveyed to the bioscrubber. The performance of the bioscrubber for the removal of toluene from the gas stream was evaluated by calculating removal efficiency (RE%) and elimination capacity (23, 24). Where Q is the gas flow rate (m3/h), Cin and Cout are the inlet and outlet toluene concentrations (mg/m3), and V is the volume of the bioreactor medium (m3). Three different cutting oils were provided in three concentrations and their toxicity effects on the microorganism were examined by the colony counting. The result of biocompatibility testing showed that for all studied cutting oils, the volume fraction of 10% did not have any considerable effect on the growth of microorganisms compared to the control sample. However, the toxicity effect of concentrations of 20 and 30% was noticeable. Table 2 indicates some physical and chemical properties of the studied cutting oils. The results of biocompatibility testing showed the toxic effects of Viyer 4000 and Viyer 5000 were the same. Viyer 5000 at the concentration of 10% due to lower viscosity was chosen as the organic phase to be studied in the bioscrubber. At three concentrations of cutting oil and water mixture, toluene at the outlet of impinger was measured and then the concentration of toluene in the liquid phase was calculated according to Equation 2. When the toluene concentration at the inlet and outlet of impinger was fixed, it was assumed that the saturation point has reached. Figure 3 presents the concentration of toluene in the gas phase at the outlet of impinger as a function of time in different combinations of cutting oil and water. When the impinger contained only water, the concentration of toluene quickly reached the saturation point. The result showed that for a 10% water-cutting oil mixture, 50% of toluene was absorbed after 200 minutes while this occurred for 20 minutes for water. Table 3 represents the concentration value at saturation point (Cs) and the apparent mass transfer coefficient (kLa) in different scrubbing solutions. Addition of cutting oil to the aqueous phase could enhance the liquid concentration of toluene. For hydrophobic compounds, such as toluene, using an organic phase for improving absorption is necessary. For this test as mentioned before, the toluene-containing gas in the headspace of three bottles containing a mixture of nutrient, sludge, and liquid toluene and one control bottle was sampled and analyzed after 72 hours incubation. Figure 4 depicts the comparison of toluene concentration in the headspace of the test samples and the control sample. As seen in Figure 4, the toluene concentration is significantly higher in the control sample than in the test samples. The results confirmed that biodegradation of toluene occurred using microorganisms in the sludge from a petroleum refinery. The volume fraction 10% of cutting oil was selected as the organic phase based on the results of the biocompatibility test. Then, the effect of the organic phase in various operational conditions of bioscrubber was investigated. After adaptation of microbial consortium in the bioreactor, removal efficiency and elimination capacity at different toluene loads were studied. Figures 5 and 6 illustrate the trend of toluene removal over time, with and without the use of cutting oil in the scrubber solution, respectively. The mean toluene RE and CE increased from 22.5 to 55 and from 34 to 69, respectively, when cutting oil was added to water. The results indicated that the increment of cutting oil fractions would inhibit the microorganism growth. Similarly, Fabian and Pivnick studied the effect of various cutting oil concentrations on a microbial population in the emulsion. They showed that as the oil concentration increased, the mean generation time in the logarithmic phase decreased. They concluded that the number of populations was much lower at higher concentrations of toluene. It could be due to some autoantibiotic effects which were exerted at higher concentrations of oil but not at lower concentrations (25). The use of the organic phase at the concentrations of greater than 10% may increase the energy consumption of the liquid recycling. Karimi et al. showed that the use of 10% volume fractions of silicon oil significantly decreased power consumption in a two-phase partitioning stirred tank bioreactor compared to 20% and 30% fractions. They also deduced that the optimal silicone oil fraction was 10% from the viewpoint of oxygen transfer (26). It was observed that the reduction of the volumetric oxygen transfer coefficient (kL) could occur at higher silicone oil fractions. It can be explained by the decrease of oxygen diffusion because of oil droplets slightly taking the liquid film around the bubbles or the reduction in the interfacial area (26-28). Different organic phases such as silicon oil, hexadecane, and n-hexadecane have been used in previous studies for the operation of two-phase partitioning bioscrubbers (3, 29). However, these compounds are more applied to laboratory-scale experiments. Recently, cutting oils that are commonly used in machining metal parts have been investigated in semi-industrial bioscrubber units because of their low cost and availability (21). Many factors can affect the mass transfer behavior such as physical and chemical characteristics of the pollutant, viscosity of the liquid medium, gas and liquid flow rate (L/G ratio), gas velocity, pH, and temperature of operation (30). According to Table 3, the addition of cutting oil could significantly decrease the mass transfer coefficient (kLa) of toluene and increase the concentration values at the saturation point of toluene in the solution containing cutting oil. It has been shown that an increase in oil fraction leads to an increase in the viscosity and degree of the pseudo plasticity (31). It has been demonstrated that when oil fraction increases, the mean distance between the droplets becomes smaller, so it simplifies compacting of oil and leads to increased viscosity (31, 32). Mohd Sauid et al. concluded that the effect of increases in viscosity and changes in rheology of the solution with the increase of oil fraction is more important than the effect of decreased surface tension, which resulted in the decrease of kLa. Indeed, the oils with higher viscosity have lower kLa value due to surface immobility and lower bubble motion (31, 33). Many studies have shown that using the organic phase in two-phase partitioning bioreactors (TPPBs) can increase affinity to O2, thereby resulting in the improved O2 mass transfer rate from the gas phase to the microorganisms and the enhanced biodegradation of the pollutant (10, 34). Montes et al. also showed that the affinity of silicon oil to O2 is higher than the affinity to water (up to 10 times) (35) since the organic phase created a thin layer at the gas-liquid interface, acting as an intermediary for the movement of O2 to the aqueous phase(31). According to our findings, the concentration of toluene at the liquid phase enhanced with the use of cutting oil compared to water alone. Lalanne et al. confirmed that the addition of cutting oil to scrubber solution increases the concentration at saturation of aromatic compounds, which is consistent with our results (21). Indeed, the addition of the oil can modify the rate of transfer of the test gas across the boundary layer (27). It has been proven that the concentration at saturation of the compounds in the aqueous phase is a reciprocal function of the Henry coefficient, and it depends on the hydrophilic character of the pollutant (21, 36). Mazzeo et al. assessed the BTEX biodegradation by bacteria from effluents of a petroleum refinery. They concluded that the application of the selected bacteria in biodegradation processes can be a reliable and effective tool in the treatment of BTEX and the petroleum refinery waste can be a source of hydrocarbon-biodegrading microorganisms (13). Lalanne et al. used a semi-industrial bioscrubber to assess the effect of the cutting oil on the bioscrubber performance. They showed that the addition of cutting oil as an organic phase increased the removal efficiency of hydrophobic compounds from 12% to 36% (21). This value is much less than that of in the present study, which can be due to the high L/G ratio of our test bioscrubber. The purpose of the current study was to determine the biocompatibility of cutting oil and its efficacy as the organic phase in order to enhance absorption and biodegradation rate of toluene from air streams. According to the findings that are consistent with the previous studies, it seems that the addition of oil has a positive effect on the purification of the toluene from air streams and the cutting oil at the concentration of 10% does not have a dysfunction effect on the microbial communities (21). The findings of the study showed that without the use of an organic phase, the removal efficiency and elimination capacity were very low, which can be due to the hydrophobic property of toluene. In addition, the use of cutting oil significantly decreases the mass transfer coefficient (kLa) of toluene and increases the concentration at the saturation point of toluene. 1. Chen X, Qian W, Kong L, Xiong Y, Tian S. Performance of a suspended biofilter as a new bioreactor for removal of toluene. Biochem Eng J. 2015;98:56-62. doi: 10.1016/j.bej.2015.02.025. 2. Liang WJ, Ma L, Liu H, Li J. Toluene degradation by non-thermal plasma combined with a ferroelectric catalyst. Chemosphere. 2013;92(10):1390-5. doi: 10.1016/j.chemosphere.2013.05.042. [PubMed: 23773445]. 3. Yeom SH, Daugulis AJ, Nielsen DR. A strategic approach for the design and operation of two-phase partitioning bioscrubbers for the treatment of volatile organic compounds. Biotechnol Prog. 2010;26(6):1777-86. doi: 10.1002/btpr.481. [PubMed: 20718037]. 4. Wang Z, Xiu G, Wu X, Wang L, Cai J, Zhang D. Biodegradation of xylene mixture from artificial simulated waste gases by capillary membrane bioreactors. Chem Eng J. 2013;229:508-14. doi: 10.1016/j.cej.2013.05.001. 5. Rene ER, Kar S, Krishnan J, Pakshirajan K, Lopez ME, Murthy DV, et al. Start-up, performance and optimization of a compost biofilter treating gas-phase mixture of benzene and toluene. Bioresour Technol. 2015;190:529-35. doi: 10.1016/j.biortech.2015.03.049. [PubMed: 25827361]. 6. Bouchaala A, Chan N, Malmiri HJ. Volatile organic compounds removal methods: A review. Am J Biochem Biotechnol. 2012;8(4):220-9. doi: 10.3844/ajbbsp.2012.220.229. 7. Quijano G, Couvert A, Amrane A, Darracq G, Couriol C, Le Cloirec P, et al. Potential of ionic liquids for VOC absorption and biodegradation in multiphase systems. Chem Eng Sci. 2011;66(12):2707-12. doi: 10.1016/j.ces.2011.01.047. 8. Yeom SH, Daugulis AJ. Development of a novel bioreactor system for treatment of gaseous benzene. Biotechnol Bioeng. 2001;72(2):156-65. doi: 10.1002/1097-0290(20000120)72:2<156::AID-BIT4>3.0.CO;2-V. [PubMed: 11114653]. 9. Guieysse B, Hort C, Platel V, Munoz R, Ondarts M, Revah S. Biological treatment of indoor air for VOC removal: potential and challenges. Biotechnol Adv. 2008;26(5):398-410. doi: 10.1016/j.biotechadv.2008.03.005. [PubMed: 18547770]. 10. Wilbur S, Bosch S. Interaction profile for: benzene, toluene, ethylbenzene, and xylenes (BTEX). Agency Toxic Subst Dis Regist. 2004. 11. Béchohra I, Couvert A, Amrane A. Absorption and biodegradation of toluene: Optimization of its initial concentration and the biodegradable non-aqueous phase liquid volume fraction. Int Biodeterior Biodegradation. 2015;104:350-5. doi: 10.1016/j.ibiod.2015.07.004. 12. Jin HM, Choi EJ, Jeon CO. Isolation of a BTEX-degrading bacterium, Janibacter sp. SB2, from a sea-tidal flat and optimization of biodegradation conditions. Bioresour Technol. 2013;145:57-64. doi: 10.1016/j.biortech.2013.02.004. [PubMed: 23453980]. 13. Mazzeo DE, Levy CE, de Angelis Dde F, Marin-Morales MA. BTEX biodegradation by bacteria from effluents of petroleum refinery. Sci Total Environ. 2010;408(20):4334-40. doi: 10.1016/j.scitotenv.2010.07.004. [PubMed: 20655572]. 14. Littlejohns JV, McAuley KB, Daugulis AJ. Model for a solid-liquid airlift two-phase partitioning bioscrubber for the treatment of BTEX. J Chem Technol Biotechnol. 2010;85(2):173-84. 15. Singh D, Fulekar MH. Benzene bioremediation using cow dung microflora in two phase partitioning bioreactor. J Hazard Mater. 2010;175(1-3):336-43. doi: 10.1016/j.jhazmat.2009.10.008. [PubMed: 19896765]. 16. Karimi A, Golbabaei F, Neghab M, Pourmand MR, Nikpey A, Mohammad K, et al. Biodegradation of high concentrations of benzene vapors in a two phase partition stirred tank bioreactor. Iranian J Environ Health Sci Eng. 2013;10(1):10. doi: 10.1186/1735-2746-10-10. [PubMed: 23369269]. [PubMed Central: PMC3570442]. 17. Rocha-Rios J, Muñoz R, Revah S. Effect of silicone oil fraction and stirring rate on methane degradation in a stirred tank reactor. J Chem Technol Biotechnol. 2010;85(3):314-9. doi: 10.1002/jctb.2339. 18. Munoz R, Daugulis AJ, Hernandez M, Quijano G. Recent advances in two-phase partitioning bioreactors for the treatment of volatile organic compounds. Biotechnol Adv. 2012;30(6):1707-20. doi: 10.1016/j.biotechadv.2012.08.009. [PubMed: 22960620]. 19. Mudliar S, Giri B, Padoley K, Satpute D, Dixit R, Bhatt P, et al. Bioreactors for treatment of VOCs and odours - a review. J Environ Manage. 2010;91(5):1039-54. doi: 10.1016/j.jenvman.2010.01.006. [PubMed: 20181422]. 20. Koutinas M, Peeva LG, Livingston AG. An attempt to compare the performance of bioscrubbers and biotrickling filters for degradation of ethyl acetate in gas streams. J Chem Technol Biotechnol. 2005;80(11):1252-60. doi: 10.1002/jctb.1319. 21. Lalanne F, Malhautier L, Roux JC, Fanlo JL. Absorption of a mixture of volatile organic compounds (VOCs) in aqueous solutions of soluble cutting oil. Bioresour Technol. 2008;99(6):1699-707. doi: 10.1016/j.biortech.2007.04.006. [PubMed: 17513105]. 22. Dumont E, Darracq G, Couvert A, Couriol C, Amrane A, Thomas D, et al. Volumetric mass transfer coefficients characterising VOC absorption in water/silicone oil mixtures. Chem Eng J. 2013;221:308-14. doi: 10.1016/j.cej.2013.01.102. 23. Littlejohns JV, Daugulis AJ. A two-phase partitioning airlift bioreactor for the treatment of BTEX contaminated gases. Biotechnol Bioeng. 2009;103(6):1077-86. doi: 10.1002/bit.22343. [PubMed: 19405152]. 24. Rene E, Veiga MC, Kennes C. Neural network models for biological waste–Gas treatment systems. J Biotechnol. 2010;150:41. doi: 10.1016/j.jbiotec.2010.08.115. 25. Fabian FW, Pivnick H. Growth of bacteria in soluble oil emulsions. Appl Microbiol. 1953;1(4):199-203. [PubMed: 13066033]. [PubMed Central: PMC1056903]. 26. Karimi A, Golbabaei F, Neghab M, Mehrnia MR, Mohammad K, Pourmand MR, et al. Investigation of oxygen transfer in a Two-phase partition stirred tank bioreactor in the presence of silicone oil. Chem Biochem Eng Q. 2011;25(2):209-19. 27. Dumont E, Delmas H. Mass transfer enhancement of gas absorption in oil-in-water systems: a review. Chem Eng Process Process Intensif. 2003;42(6):419-38. doi: 10.1016/s0255-2701(02)00067-3. 28. Aldric JM, Lecomte JP, Thonart P. Study on mass transfer of isopropylbenzene and oxygen in a two-phase partitioning bioreactor in the presence of silicone oil. Appl Biochem Biotechnol. 2009;153(1-3):67-79. doi: 10.1007/s12010-008-8480-0. [PubMed: 19156370]. 29. Nielsen DR, Daugulis AJ, McLellan PJ. Dynamic simulation of benzene vapor treatment by a two-phase partitioning bioscrubber. Biochemical Engineering Journal. 2007;36(3):250-61. doi: 10.1016/j.bej.2007.02.027. 30. Kraakman NJ, Rocha-Rios J, van Loosdrecht MC. Review of mass transfer aspects for biological gas treatment. Appl Microbiol Biotechnol. 2011;91(4):873-86. doi: 10.1007/s00253-011-3365-5. [PubMed: 21701986]. [PubMed Central: PMC3145080]. 31. Mohd Sauid S, Krishnan J, Huey Ling T, Veluri MVPS. Enhancement of oxygen mass transfer and gas holdup using palm oil in stirred tank bioreactors with Xanthan solutions as simulated viscous fermentation broths. Biomed Res Int. 2013;2013. doi: 10.1155/2013/409675. 32. Ma L, Barbosa-Cánovas GV. Rheological characterization of mayonnaise. Part II: Flow and viscoelastic properties at different oil and xanthan gum concentrations. Journal of Food Engineering. 1995;25(3):409-25. doi: 10.1016/0260-8774(94)00010-7. 33. Wang CC, Hafner A, Kuo CS, Hsieh WD. An overview of the effect of lubricant on the heat transfer performance on conventional refrigerants and natural refrigerant R-744. Renew Sustain energy Rev. 2012;16(7):5071-86. doi: 10.1016/j.rser.2012.04.054. 34. Quijano G, Revah S, Gutiérrez-Rojas M, Flores-Cotera LB, Thalasso F. Oxygen transfer in three-phase airlift and stirred tank reactors using silicone oil as transfer vector. Process Biochem. 2009;44(6):619-24. doi: 10.1016/j.procbio.2009.01.015. 35. Montes M, Veiga MC, Kennes C. Effect of oil concentration and residence time on the biodegradation of alpha-pinene vapours in two-liquid phase suspended-growth bioreactors. J Biotechnol. 2012;157(4):554-63. doi: 10.1016/j.jbiotec.2011.07.019. [PubMed: 21807039]. 36. Staudinger J, Roberts PV. A critical review of Henry's law constants for environmental applications. Crit Rev Environ Sci Technol. 1996;26(3):205-97. doi: 10.1080/10643389609388492.